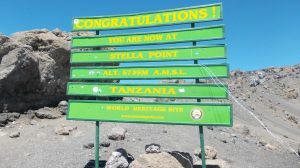 An overnight resting point located on the south-eastern base of Kibo and on mount Kilimanjaro. 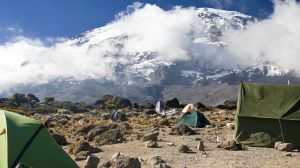 It also is one of the last camps encountered before reaching the summit of the mountain, others being kibo huts, arrow glacier camp and school huts. 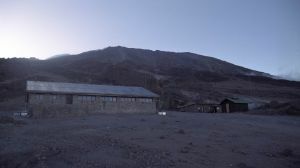 Barafu hut campsite lacks any form of cabins for accommodation, requiring all climbers to have their own tents for sleeping in. However, there is a rangers hut, perched near the end of the ridge enabling to have views far off into the horizon, of all the approaching hikers. The camp also has a large campsite area for climbers, but due to the large numbers of rocks and toilets at the site, good spots are hard to find when there are large numbers of people present. Toilets at the camp are provided in the form of pit latrines, some of which are located close to the edge of the ridge. 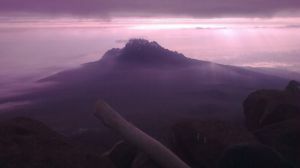 Barafu hut is located on top of a ridge and at the south eastern base of Kibo — mount Kilimanjaro. Despite there being ice near the campsite, water at the camp is scarce and is normally limited to what porters carry, usually cooking or drinking water. The campsite is also in the alpine desert region, an area with no vegetation or animals, no rainfall and an occasional snow fall. Its position on top of a ridge puts it in the way of high winds and low temperatures, with very low humidity. Most of the ground here is filled with rocks, volcanic soils and little scree. Are you associated with Barafu Hut campsite? Contact us to improve this page or create another page for your business.